Imperviousness in cities is a spatial, material and hydrographic design research problem. It has been long-studied in scientific disciplines as a source of multiple hydrologic and social impacts.2 Yet to date, there are few systemic design proposals for addressing pavement on the scale of these impacts. In the design fields, the ubiquitous presence of urban pavements presents an intriguing design research area, and many argue, that such patterns representing planetary surface manipulation, must be situated back in the land, land processes and landscape geographies.3 The negative impacts of high concentrations of pavement, as characterize cities, are local, regional and territorial in their consequence. This paper evaluates this urban infrastructure design issue and proposes a reflective design process to re-situate urban surface design within the hydro-geologic origins of cities. 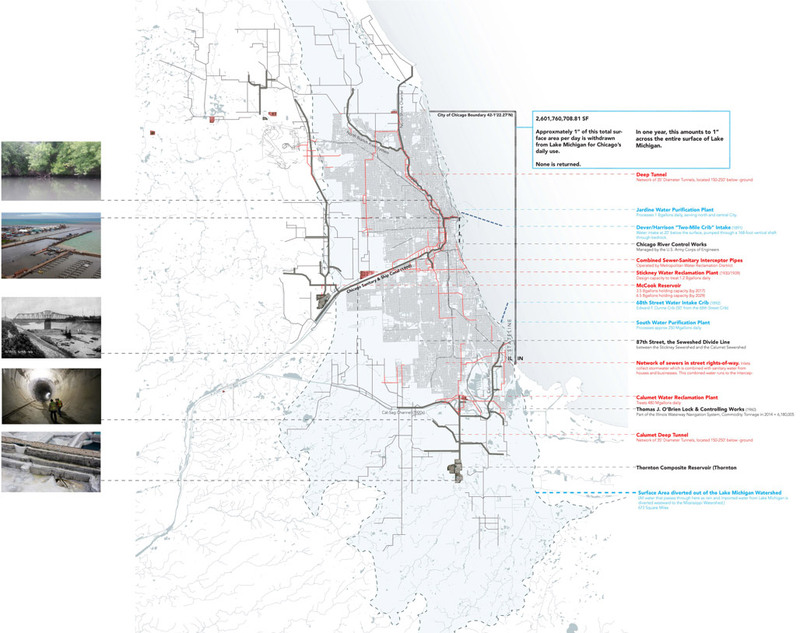 Through a case study of Chicago, where the urban surface impacts the Great Lakes to the Gulf of Mexico, I emphasize the need for territorial design to address such conditions. 3. Evaluating the scope and scale of design potentialities. a.Can we find and reclaim surface geology that still exists? b. If so, can we re-engage that material in the reimagination and regeneration of our cities? c.More specifically, can we address urban hydrologic design byincorporating knowledge of geologic systems and soils? d.Lastly, can design disrupt outdated conventions of asphalt surfaces in cities, and invent new surfaces that transform urban hydro-ecologies? During the years 2010-2012, I was flying regularly from Chicago, Illinois to Pittsburgh, Pennsylvania. My flights out of Chicago’s Midway Airport traversed the southern Lake Michigan coast, providing aerial views of the South Side of Chicago, the Calumet Corridor and Gary, Indiana. Curious, stripe-patterned patches of land trapped between the industrial landscapes of this region ignited my curiosity. These patterned patches turned out to be remnants of the dune and swale landscape of the Lake Michigan coast, among a larger system of beach ridges, sand dunes and spits. Although these southern Lake Michigan coastal landscapes were largely manipulated during an aggressive urban and industrial period,19 many still remain in this region today. Traveling to search for these sites on the ground led to traversing private land, owned and operated by industrial operators in the region (Fig. 1). At the time, I sensed these landscapes were a clue to unlocking dysfunctional regional relationships with water and may provide a strong material-ecological basis of hydrologic design. My proposition is that design research methods may uncover, reframe and invent responses and solutions to some of the most entangled urban design; and that engineering conditions for water in cities will be rooted in the design of deeper surficial landscape systems, such as this one. Birds-eye photographs of southern coast of Lake Michigan, glacial remnants in between the industrial sites of the Chicago-Calumet, Illinois and Gary, Indiana corridor (upper images); site photographs of dune-swale landscape of the coastal geologic area (lower images). The critical aspect of understanding this extraordinary, yet still inadequate, system is the needless urban surface drainage of stormwater into it. Stormwater that flows into TARP begins at the paved urban surface where rapid run-off bypasses the soil’s potential for natural infiltration, leading to street flooding, massive rainwater run-off and contaminated water flowing to other regions.26 Locally, pavement concentrations increase urban heat island effect which in turn both negatively affects human health and severely impacts local soil quality through compaction that prevents water, gas and air exchange.27 Imperviousness is an incredibly pervasive condition. American cities, Chicago included, are characterized by 50-90% impervious surface, with pavement accounting for 25-50% of this total land cover, or two-thirds of the total ground surface.28 Asphalt, the primary pavement material, dominates the visual and performative ground of cities. The continued use, presence and consequences of the surface sealing of cities are mind boggling, and specific design and planning tools are needed to address this problem.29 As such, the paved condition of the urban-earth surface is a fundamental, but under-explored problem in design practice and education.30 Since surface is where rainwater makes first contact, our cities need systemic design interventions at the surface level to keep water needlessly draining away. Water infrastructure of Chicago. A network of interceptor pipes, tunnels and reservoirs, from which 99% of the city flows into a combined sewer system. Chicago is permitted to withdraw approximately 2 billion gal. [7,5 billion L] of water per day from Lake Michigan, and exports this as sanitary water combined with stormwater westward outside of its watershed to the Mississippi River Watershed. There is a wide distribution of impervious conditions across a city, determined by district land-use such as industrial, commercial and residential.31 For Chicago, most pavement lies within the gridded roadway system (23% of the urban surface), and within the parking lots of residential, commercial and industrial areas. For overall concentrations by percentage, the National Land Cover Database is a useful and ubiquitous tool (Fig. 3). 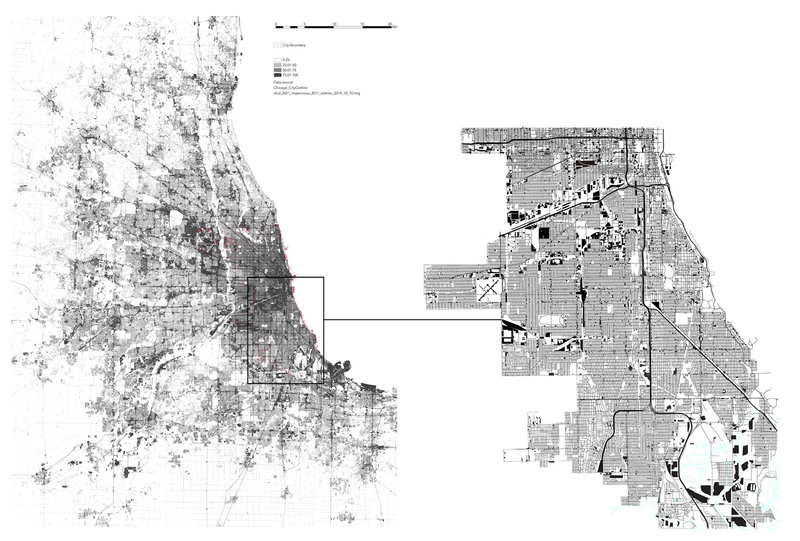 Yet to identify design strategies, the specific configuration of paved surface is key, so I inventoried the South Side of Chicago to spatialize the distribution of patterns and site types. The “on-the-ground” configuration of impervious surface by type (e.g. parking lots, industrial sites, vacant land) provides a starting point for establishing site-specific approaches for intervention, given micro-scale material, topographic and environmental conditions and desires. Imperviousness in Chicago and metropolitan region. Source: National Land Cover Database, NLCD 2011 (left); asphalt inventory (South Side, Chicago) of surface parking lots, industrial lots, streets, using GIS City of Chicago data portal “streets edge layer” supplemented by aerial photographic analysis (right). Sands, dune sands, and gravel areas, shown in tawny, yellow, and orange, along 5 mi. [8 km] margin of shoreline. Adapted from USGS Surficial Geology, Illinois-Indiana, Calumet Quadrangle, 1902 (left); composite of unconsolidated soil areas (center); Lidar (2008) of Chicago South Side neighborhoods Washington Park, Hyde Park and Woodlawn, dune ridge topography visible (right). 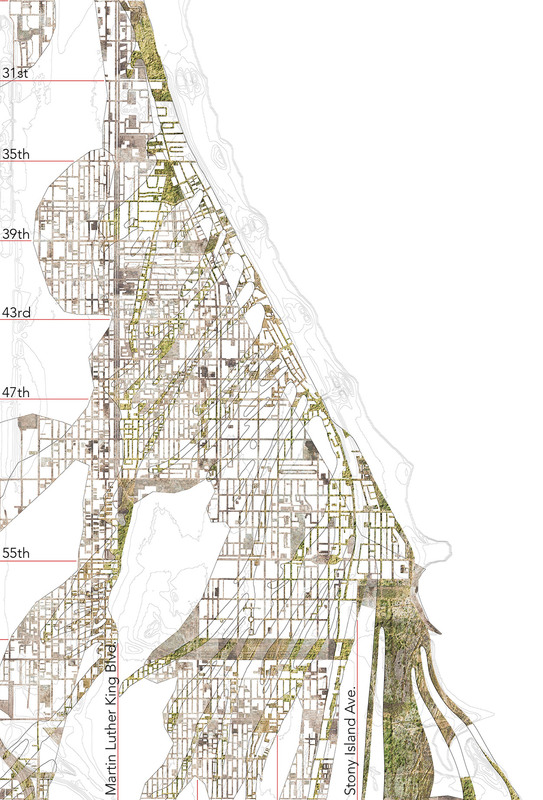 Because the full study area spans the South Side of Chicago into the Calumet region, an area over 100 sq. mi. [259 km2], I selected a 10 sq. mi. [25,9 km2] subset of this region for finer analysis. The sample area consisted of ten sections (one section = one sq. mi. [2,59 km2]) spanning a 5 mi. long by 2 mi. wide [8 km by 3,2 km] area along Stony Island Avenue, from Jackson Park in the north to Lake Calumet in the south (Fig. 5). Through soil log review at the Geologic Records Unit of the ISGS (Fig. 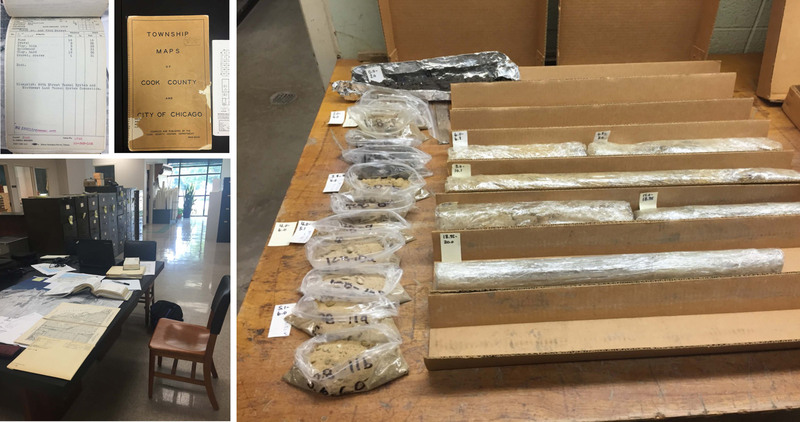 6), we reviewed approximately forty drill logs to confirm the distribution and thickness of permeable, unconsolidated soils of sand, sand and gravel, gravel and silty sand, containing high hydrologic conductivity potential compared with silty clay, also present in the urban area. Recording the distance from urban surface to the top of permeable soils (typically right at or within 2 ft. [60 cm] of the surface), and the thickness of the permeable soils, we indexed the data into a Rhino model to spatialize the location and thickness of near-surface permeable soils in the sample area. We then extrapolated that method to model the stack unit thickness data for the larger study area (Fig. 5). The potential for designing with this soil has not been explored to date, and our rediscovery of this geologic capacity in the city is a breakthrough concept for Chicago. Permeable soil area, data indexed from University of Illinois Geologic Records Unit soil logs, modeled in Rhino (upper-left); cross-sections of sands, same data set (lower-left); permeable soil areas (Stack-Unit Maps & Bretz Maps) Southside of Chicago, modeled in Rhino. Chicago streets network for scale (right). Drill log sample, Geologic Records Unit, University of Illinois (left); soil core, Illinois State Geological Survey: Hamilton Park: 38N 14E Section 28, Core #C 15302 (0’ - 20’), API 120313433500, Natural Resources Soils Library, University of Illinois (right). Key to identifying sites where impervious surfaces hide promising sub-surface infiltration capacity is to combine the imperviousness and soil infiltration data sets into one model (Fig. 7). Surfaces were assigned an imperviousness percentage value. Underlying soils were given a value related to their thickness. When I conducted the same process of correlation for the ten sections sample area (at Jackson Park), the specific soil thickness values are used within each cell. In the larger model, with only two soil thickness categories available, the results are generalized. The values for surface and sub-surface were parametrically linked to assign a “score,” creating an index of correlation between imperviousness and permeable soils. In the model, large circles indicate greater degrees of impermeable surface overlying thicker, permeable soil. Smaller circles indicate lower percentages of impermeable surface over shallow soil thickness. The double-factor dot-density map provides a visualization of where interventions are more or less promising to disrupt the paved surface and to promote infiltration. 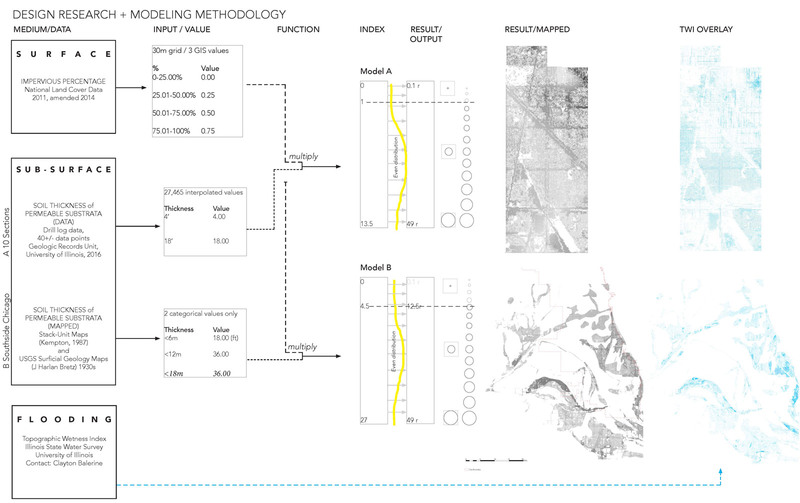 Modeling methodology diagram correlating imperviousness, permeable soils and localized flooding. I incorporated the TWI data into the surface-subsurface model as a flooding gradient, color coded from light to dark, with the darkest sections representing the areas with highest flood potential. The imperviousness-permeability dot density maps were laid over the TWI, and the value gradients are visible through the surface-subsurface dot density map. The final composite map combines surface imperviousness, subsurface soil areas and the likelihood of flooding, visible as dot density matrices showing the highest correlation among these critical three factors. Urban neighborhoods with large dot density patterns become high priority selection areas. This method reveals, that although the problem is vast and variable, concentrations of “high opportunity sites” do exist (Fig. 8). However, I observed that pavement and topographic relief were major drivers in the results. The correlation of soil type provides a third characteristic which influences target areas in the model. The underlying geology (Fig. 9) remains an untapped solution to this issue with over 2,000 acres [809 ha] of street, parking and vacant land surface just in the illustrated area alone. One in. [2,54 cm] of rainfall over 2,000 acres of surface equals nearly 55 million gal. [208 million L] of rainwater. Sites with high infiltration capacity will handle higher volumes. Ironically, the material conditions of underlying geological soils do not presently influence infiltration; yet the broad topographic relief of these geologic features (Fig. 10) may be playing a role in the overall patterns of water flow and flooding due to the mostly impervious condition of the surface. Sample target site areas (at the neighborhood scale) where surface imperviousness, permeable soils and downslope flooding potential coincide (left); inventory of surface types within this site area (right). Illustrative of dune soil types under impervious and compacted ground in the Bronzeville, Washington Park, Hyde Park and Woodlawn areas. Extent of land surface (impervious and compacted ground) by major category: 1,080 acres [437 ha] of street surface, 800 acres [323 ha] of parking surface and 285 acres [115 ha] of vacant land surface. Site photos, from on top of dune ridge. From Vincennes Avenue, looking east along 41st street (left); the same dune ridge farther to the south, in the northwest area of Washington Park (right). 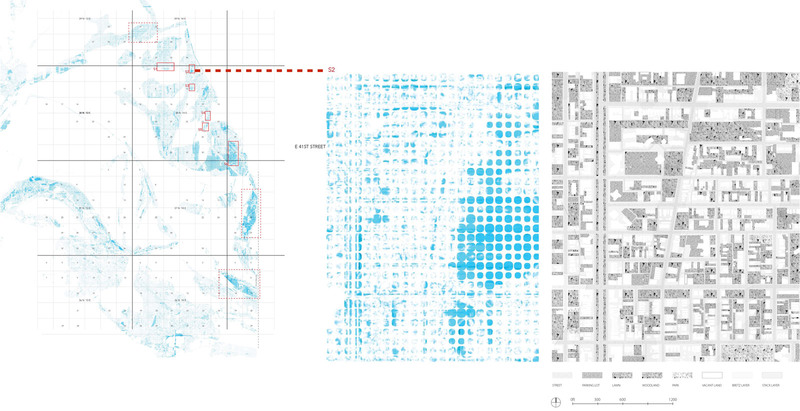 The three-factor dot density map encompasses a total area of over 30 sq. mi. [77,7 km2] of South Side of Chicago representing flood-prone neighborhoods. Given the vast area for potential design opportunity, the next step is to pursue design prototypes that remove and reconfigure impervious surfaces to promote infiltration. I propose two general design operation categories to transform these surfaces (Fig. 11). Proposed subtractive and additive surface operations relative to physical and environmental surface conditions, environmental and social contexts and sub-surface conditions. The first interventionist strategy is a subtractive process, whereby material is selectively removed from the impervious contact layer to infiltrate and conduct water through subsurface soils. Subtractive surface operations include asphalt removal through milling, cutting, trenching and drilling. Horizontal dimension, pattern and depth of these surface removals can vary widely according to equipment selected, but more importantly should be guided by several criteria of the specific sites. Existing surface conditions such as age and condition of impervious surface materials, topographic contour, slope variation and flooding gradient will determine the decision of where along these surface conditions to interrupt water accumulation and flow. Overall pattern of disruption is a key aesthetic concern in this project. Social and urban-land context such as land-use type and density of imperviousness in a given area will determine the freedom of surface design options. The reactions and participation of adjacent neighborhoods will vary according to the psychological impact of existing flooding conditions, influencing the designs to alleviate that flooding. Fieldwork studies of contamination will be vitally important to avoid potential solubility. The second interventionist strategy is additive in order to enhance stormwater performance and to integrate these sites visually to the neighborhood. Functionally, planting stormwater trees and perennials is essential to breaking up soil and increasing porosity. Even in vacant land, soils are severely compacted and need sustained, long-term disturbance through root growth. The selection of planting program for each site should vary according to needs of the community. Although one could argue for reforestation, given that tree roots are excellent for penetrating poor surface soils, other planting programs are also effective. Soil samples from the site should guide new plant selections. Although plants associated with dune ecologies of the region might be preferred in some sites, and a visual continuity throughout the project area is desirable from an urban landscape perspective (Fig. 9), adapting to contemporary needs and desires of the local community should guide design. This attitude will allow for flexible adaptation of a regional ecological palette. If a partial structural surface is still needed, to park cars for instance, permeable, modular pavement can replace the impervious material, as an additive strategy. In order to help persuade stakeholders to adopt this stormwater approach as a long-term resolution to flooding, test plots should demonstrate the hydrologic performance enabled by these new water-activated surfaces. Studies can compare these water infiltration sites with water holding sites to help cities with varying conditions decide which strategies will be most effective.44 Future research should also consider the economic implications associated with design conversion of the surface sites by comparing the cost of surface infiltration strategies with that of current stormwater management strategies (i.e., the cost of flooding, or the cost of doing nothing). Landscape performance research can evaluate the economic, environmental, social and aesthetic benefits from capturing and infiltrating water where it falls, as opposed to the cost of collecting, storing and treating the same water through the gray system. Low-tech ways of direct infiltration and of diverting water from entering the inlets can cost almost nothing.45 The strategies proposed above are anticipated to involve an initial depaving cost, followed by amendments, planting and seasonal maintenance, but they are likely far less expensive, and potentially more transformative of urban neighborhoods than retrofitting existing underground infrastructure. Certainly these strategies are accessible and cost effective measures for cities when compared to the extraordinary degradation caused by stormwater mismanagement and the cost of collecting, conveying, pumping and treating stormwater through the combined system. Based on the preliminary research presented above, I am now leading an interdisciplinary team to continue this investigation in the southern Calumet region of the study area. Sponsored by NOAA (National Oceanic and Atmospheric Administration), the National Sea Grant program funds research to develop resilient coastal communities. The study will update the geologic soils database with on-site and modeled hydrologic characteristics based on fragility curve analysis. This quantifiable design data will inform precise recommendations on retrofitting urban surface design scenarios for the city and region. This study should provide a replicable urban design retrofit process for neighborhoods and wards in the project area. Further, while this two year project does provide strategic design options from which municipal leaders can more confidently allocate investment, it does not intend to force policy revisions. Landscape leaders such as Kongjian Yu argue that scale must be linked from policy to site implementation,46 but I argue that there may be ongoing barriers to institutional acceptance. Generalized stormwater planning policies and goals may be more effective through “adaptive governance.” 47 The flexibility of informal planning strategies benefitted by decentralized decision-making, an educated citizenry and bottom-up approaches may increase implementation. The team will work directly with community and municipal leaders in this bottom-up manner to integrate this design data to retrofit urban surface conditions according to soil types. Thus, we will learn whether a lack of larger urban institutional controls and constraints may actually benefit working with local municipalities, neighborhoods and land-owners to adopt local, site-driven approaches. Based on the outcome, strategies to institutionalize may still be worth pursuing to systematize adoption at a broad scale. William Cronin opens Nature’s Metropolis with the pithy line, “Before the city, there was the land.” 48 He reminds us that natural systems were rapidly exploited through urbanization and industrialization, their ecological function externalized through a control of nature. If resiliency can be defined as working with natural flows and forces, then tapping into the “pre-urban” hydro-geologic conditions of cities is a pathway forward to unlocking a future through an understanding of the past. This paper explores how a knowledge of urban infrastructure systems and a desire to root stormwater design in the deeper landscape conditions of the city might lead to novel and systemic interventions. Put bluntly, it is not enough to modestly intervene. As designers, we need to question the conditions that create these issues and to propose systemic change. 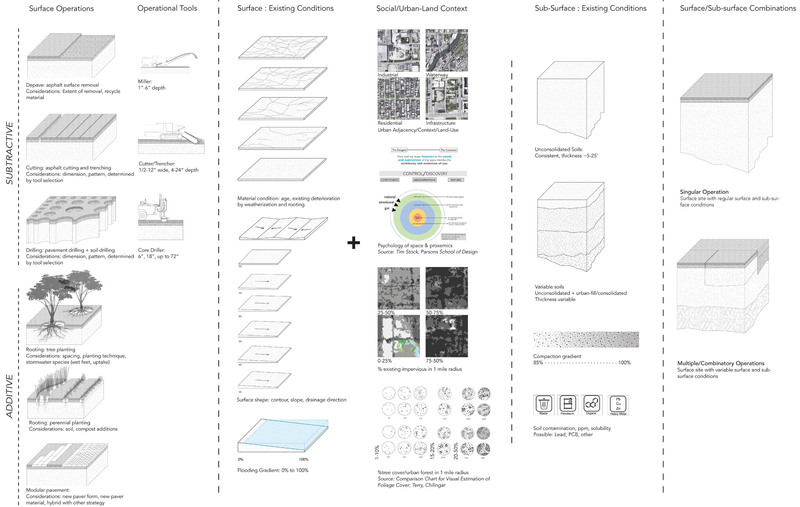 Environmental site-based design fields should lead design research on this issue, transforming spatial matrices for surface water design on a large, systemic scale.49 With a decidedly reflexive approach, grounded in concepts offered through “landscape as infrastructure” and “water urbanism,” 50 this design research involves identifying and correlating disconnected urban systems and aggressively reconnecting their behaviors through landscape processes. Though each city is unique, this hydrogeological stormwater approach is relevant and applicable within other cities of the Great Lakes region, which sits as a harbinger for urban water design relationships. Within this intensely urbanized and post-industrial megaregion, impervious cover is a primary and urgent issue across the territory, providing opportunities for re-thinking pavement systems and transforming vacant lots and abandoned pavements into socially, environmentally and economically vital land.51 As climate disturbance has shown, we need innovative ways to transform and adapt the local conditions of these highly populated and vulnerable areas, and to return functionality to the land as an adaptive buffer to forces in our climate. Across the range of spatial densities and urban surfaces, understanding and engaging the geology underneath that surface will increase and enlighten the productivity of our efforts. William Cronin, Nature’s Metropolis: Chicago and the Great West (New York: W.W. Norton, 1992), 23. See Chester and Gibbons (1996, 243―58); Kida and Kawahigashi (2015, 135―46); Lee and Heaney (2003, 419―26); and Wicke, Cochrane and O’Sullivan (2012, 347―54). See “The Limits of the Plan,” Foreground (2017); Belanger (2013, 42―54); and Maciocco (2008). Elizabeth Anne Ellsworth and Jamie Kruse, Making the Geologic Now: Responses to Material Conditions of Contemporary Life (Brooklyn, NY, USA: Punctum Books, 2013). Jason A. Rech, Kathleen B. Springer and Jeffrey S. Pigati, “The Great Acceleration and the Disappearing Surficial Geologic Record,” GSA Today 27, no. 11 (November 2017): 8-9. See Lokman (2017, 60―73); Meyer (1997, 45―79); Shane (2005); and Spirn (1984). M. Elen Deming and Simon Swaffield, Landscape Architecture Research: Inquiry, Strategy, Design (Hoboken, NJ, USA: John Wiley & Sons, 2011). Jane Bennet, Vibrant Matter: A Political Ecology of Things (London: Duke University Press, 2010). See Dorst (2011, 521―32) and Faste and Faste (2012). Antoine Picon, “Constructing Landscape by Engineering Water,” in Landscape Architecture in Mutation: Essays on Urban Landscapes, ed. Hubertus Adam (Zurich: gta Verlag, 2005), 99–115. See Lawson (2005); Steiner (2014, 304―11); and Windhager, Steiner, Simmons and Heymann (2010, 107―23). See Ahern (2006); Fleming (2016, 23―36); and Nassauer (1997, 65―83). See Desimini (2014, 17―35) and Haase (2008, 1―8). Antke Backhaus, Torben Dam and Marina Bergen Jensen, “Stormwater Management Challenges as Revealed through a Design Experiment with Professional Landscape Architects,” Urban Water Journal 9, no. 1 (February 2012): 29–43. Isabelle Doucet, “Planning in Search of Ground: Committed Muddling through or a Critical View from Above?” in The Territorial Future of the City (Urban and Landscape Perspectives) 3, ed. Giovanni Maciocco (Berlin: Springer Science+Business Media, 2008), 49. Patrick Healy and Gerhard Bruyns, eds., De-/Signing the Urban. Techno-Genesis and the Urban Image (Rotterdam: nai010 publishers, 2006), 92–108. Doucet, “Planning in Search of Ground,” 51. See Faste and Faste (2012); Deming and Swaffield (2011); Schön (1983); and Simon (1969). Robert T. Kay, Theodore K. Greeman, Richard F. Duwelius, et. al., Characterization of Fill Deposits in the Calumet Region of Northwestern Indiana and Northeastern Illinois, US Geological Survey, Water Investigations Report 96-4126, US Department of the Interior, 1997. See Tortajada, Varis, et. al. (2006) and Sedlak (2015). See Cronin (1992); Gandy (2002); Kaika (2004); and Platt (2005). Richard Lanyon, Building the Canal to Save Chicago (Chicago: Lake Claremont Press, 2012). Metropolitan Water Reclamation District of Greater Chicago, “Tunnel and Reservoir Plan,” 2016, https://www.mwrd.org/irj/portal/anonymous/tarp. Lee and Heaney, “Estimation of Urban Imperviousness,” 2003. See Kida and Kawahigashi (2015, 135―46) and Wicke et. al. (2012, 347―54). Lisa Gartland, Heat Islands: Understanding and Mitigating Heat in Urban Areas (London: Earthscan, 2008). See Shirmer, Leschik and Musolff (2013, 280―91) and Vanderhaegen, De Munter and Canters (2015, 133―42). See Belanger (2006); Ben-Joseph (2012); and Lenzholder and Brown (2013, 89―99). See Akbhari, Rose and Tara (2003, 1―14) and Van de Voorde, Jacquet and Canters (2011, 143―55). Deryck W. Holdsworth, “Landscape and Archives as Text,” in Understanding Ordinary Landscapes, eds. Paul Groth and Todd W. Bressi (New Haven, CT, USA: Yale University Press, 1997). Daniel H. Burnham and Edward H. Moore Bennet, Plan of Chicago: Prepared under the Direction of the Commercial Club during the Years MCMVI, MCMVII, and MCMVII (Chicago: Commercial Club, 1909). Michael J. Chrzastowski, “Make No Little Plans: Field Trip Guidebook for the American Shore & Beach Preservation Association 2008 National Conference” (Illinois State Geological Survey, Guidebook 36, Chicago, October 15-17, 2008). Chris Moyles, John Swallow and Micah Silvey, “High Performing SITES and the Soils Beneath Them” (American Society of Landscape Architects, National Convention, Los Angeles, October 21, 2017). J Harlen Bretz, “Surficial Geology Maps” from Bulletin 65: Geology of the Chicago Region: Part II, The Pleistocene, 24 maps, 1:24,000, 1939, http://isgs.illinois.edu/maps/isgs-quads/surficial-geology-1939/berwyn; Steven Brown, ISGS and Mark Bramstedt, USDA, conversations dated 3/29/2016 and 6/6/2016 with a quaternary geologist and soil scientist confirm, through their own on-site soil fieldwork and mapping in the Chicago, Calumet and Northern Indiana territories, that the 1930s Bretz maps have been the most accurate historical record of soils in the area. Richard C. Berg and John P. Kempton, “Stack Unit Mapping of Geologic Materials in Illinois to a Depth of 15 Meters,” from Circular 542, published by Illinois State Geologic Survey, 1988. Richard C. Bumstead, FASLA, Associate Director for Campus Environment, University of Chicago, interview, October 16, 2017. Clayton Ballerine, GIS Specialist formerly of the ISWS, is the creator and owner of the database scripts. Conversation and consultation (7/7/2016) with Clayton Ballerine. U.S. Environmental Protection Agency (US-EPA), “Evaluation of Urban Soils: Suitability for Green Infrastructure or Urban Agriculture,” Publication No. 905R1103, December 2011, https://nacto.org/docs/usdg/evaluation_of_urban_soils_epa.pdf. U.S. Environmental Protection Agency (US-EPA) “Infiltration Through Disturbed Urban Soils and Compost-Amended Soil Effects on Runoff Quality and Quantity, Research Report,” Office of Research and Development, EPA/600/R-00/016, December 1999, http://www.water-research.net/Waterlibrary/runoffeq/soilinfiltrationepa.pdf. Tadanobu Nakayama and Tsuyoshi Fujita, “Cooling Effect of Water-Holding Pavements Made of New Materials on Water and Heat Budgets in Urban Areas,” in Landscape and Urban Planning 96, no. 2 (May 2010): 57–67. See Hager (2003) and Valderrama, Levine, et. al. (2013). Kongjian Yu, “China’s Water Crisis: Projects Leading Water Policy: Water Urbanism Across Scales,” in Water Urbanisms East, eds. Bruno De Meulder and Kelly Shannon (Zurich: Park Books, 2013), 20–47. Carol J. Burns and Andrea Kahn, Site Matters: Design Concepts, Histories, and Strategies (New York: Routledge, 2005), 93–129. See Belanger (2009, 79―95) and De Meulder and Shannon (2013, 4―9). Joseph Schilling and Jonathan Logan, “Greening the Rust Belt: A Green Infrastructure Model for Right Sizing America’s Shrinking Cities,” Journal of the American Planning Association 74, no. 4 (October 2008): 451–66. I sincerely thank geologists and staff within the University of Illinois, Prairie Research Institute: Andrew Phillips, David Grimley, Steven Brown, Olivier Caron, Bob Mumm, and Virgie Amacher; and previously with ISWS, Clayton Ballerine. I thank Alpa Nawre, Andrew Phillips, and Martin Holland for feedback on an earlier version of this paper. For this research, funding is provided by Brent & Jean Wadsworth, the Wright Ingraham Institute, and the UIUC-FAA Design Research Initiative; from this support, I also thank graduate research assistants Meng Shui, Heena Gajjar, Qiran Zhang, Zheng Cong, and Jinyu Shen. I extend deep appreciation to Professor Kevin Bone of The Cooper Union for his enthusiasm and support following presentation of early work at the ‟Water+ symposium at the Faculty of Architecture, University of Manitoba, Winnipeg, Can., in Winter 2016. Figures 1 - 11: images and diagrams created by the Author. Figure 2: diagram created using City of Chicago street centerlines GIS data, and raster data (redrawn) from MWRD and Chicago Department of Water Management. Figure 3: right, inventory created using Chicago street edges GIS data and aerial imagery. 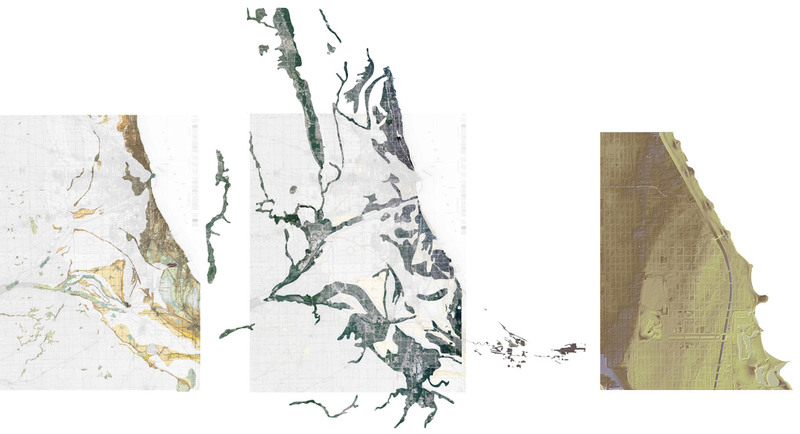 Figure 4: left, image adapted by the Author from United States Geological Survey, 1902; center, image adapted by the Author from data sources: Stack-Unit Map of Northern Illinois (to a depth of 15 m) by Richard C. Berg and John P. Kempton 1987 and Surficial Geology of the Calumet Lake Quadrangle, by J Harlen Bretz, State Geological Survey Division, 1930-32); right, Lidar data set.